The background of this print uses the itame mokuhan (板目木版) or imitation woodgrain technique. "The printing of a wood grain within a print. A wood plank is soaked in water to open up the grain and is then inked and printed to intentionally reproduce the nature of the wood itself." The exact date is in the cartouche along the right side. It reads: Bunsei 6, 3rd month - 文政六癸未年三月. 癸未 indicates that it is the 20th year of the 60 year cycle. Hokushū produced several surimono using the grain of the woodblock to achieve a simulation of real wood. A fabulous piece of early graphic art. Rare. "Nakamura Utaemon III poses in formal courtier robes decorated with stylized plum blossom motifs. As noted in the text written in Chinese characters to the right of the figure, he is portrayed in the role of Kan Shōjō (the Chinese characters for Shōjō are often reversed, as here, but are read the same way) from the kabuki play Sugawara and the Secrets of Calligraphy (Sugawara denju tenari kagami), which was performed at the Kado Theater in Osaka on the fifteenth day of the third month of 1823. The play was originally written in 1746 and is loosely based on the life of the ill-fated aristocrat Sugawara no Michizane (845-903), whose close relationship with the ruling emperor of his day led rivals to maneuver him into exile. 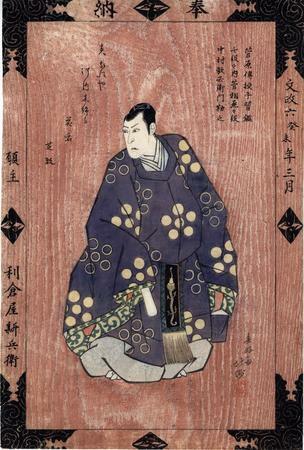 Although Utaemon played seven different roles in the play, here he is depicted as Michizane himself. The wood-grain background resembles an ema, or wooden votive shrine panel... The decoration on the border of the print replicates the lacquered metal supports and studs that embellish and protect such panels, which traditionally are presented as offerings to Shinto shrines. The word hōnō[奉納], or 'offering,' adorns the top of the frame; the characters are separated by the 'double crane' crest of the actor, which appears on the bottom and sides. On the right is the date of the performance: third month of Bunsei 6 (1823); on the left border is the name fo the publisher, Toshikuraya Shimbei. Michizane is a particularly appropriate subject for such a votive panel because after his death he was deified and became known commonly as Tenjin. Images of him were widely used as devotional objects. Quoted from: Masterful Illusions: Japanese Prints in the Anne van Biema Collection, p. 50. The translation of the poem is by John T. Carpenter. 1) In Ikeda Bunko, Kamigata yakusha-e shūsei (Collected Kamigata Actor Prints), vol. 1, Osaka, 1998, no. 145. 2) In color in Ukiyo-e Masterpieces in European Collections: Musées Royaux d'Art et d'Histoire, Brussels, vol. 9, Kodansha, 1989, #243.